Your head starts spinning. Sales are slow. At first for a day or two, then a week, then you realize it’s been a full month of a downward sales spiral. Every year around this time… panic starts to slowly creep in. …even if you know it happens to everyone. …even if you know it happened last year. …even if you thought you planned better. That’s right – the summer SLOWWWDOWN is here. Sales are slow. Traffic is slow. Engagement is less. Summer gets busy! Vacations are planned, kids are out of school, people are doing *things*. Like actual non-hibernating, non-screen time things. And in case you think it just happens to small businesses – think again! After Mother’s Day + Father’s Day, “gift giving” season really winds down (unless you wanna gift me some sweet ‘merica gear) until the BIG holiday rush. For most retailers – big or small – summer is just SLOW. …I’d like to suggest an alternate use of your time. That if you put energy into now, can pay off huge during the months traffic naturally picks back up. If you missed last week’s post, I shared my daily Pinterest strategy that grew my page views by 1,118% and how I consistently share 20+ pins each day (without having to actually be there pinning). I’ll be sharing more on Pinterest in upcoming posts, so if you haven’t started your account yet or need to whip it into shape, feel free to send over your questions so I can prioritize what I share first! Your entire focus for summer should be maximizing your EXPOSURE. Not necessarily increasing sales. And Pinterest is the perfect more “hands-off” platform to do just that. Building your traffic with a solid Pinterest strategy before the fall will give you more traffic (and more time) to kill it during the holidays. Don’t spin your wheels working hard + expecting the payoff tomorrow. Instead, work for your future. Set goals for upcoming months that will pay off huge dividends during the season people are naturally looking to buy (ahem, the holiday season. ahem, the next way below) and start creating action steps you can WORK ON this month. Don’t wait until November to start building that email list – put strategies into place today instead! I know it can be hard to watch your sales slow down, but provided you can see it’s traffic related (versus a conversion issue) or if you have your sales history and can see your average monthly sales… it can often be a better use of your time to work ahead, rather than wear down your customers just to get a handful of sales. In the 14-day Shop Detox challenge, I lead you through daily actions that will help focus your shop + improve it before the busy holiday season. If interested, click here to sign up. It’s free! This is easily one of my favorites, because well, who doesn’t like a few extra bucks coming their way?! A passive product is anything that can be created or set up once, and then sold again + again without any creation effort on your part. Examples may include digital downloads/prints, print + ship physical products (you design + a company, like Printful, prints and ships directly to customer), stock photos, pre-made logos, and more. I share over 25 passive income ideas in the (free) 4- day course: The Creative Shop Owners Guide to Passive Income. The set up is fairly quick, depending on what you’d like to do, and while it’s not overnight money – it’s a great way to build additional sources of income. I mean the average millionaire has 7 streams of income, so we should at least try a few, amiright? Plus if I could start over, I listed the 11 marketing or business investments I’d make in the first 3 months of business (for less than $50/month). And then of course, there’s affiliate marketing. If you have an audience that often turns to you for advice or suggestions, using affiliate marketing can be a great way to earn a little extra cash – while also supporting other businesses. For example, did you know Etsy has an affiliate program? You could earn a percentage of sales (without that seller taking a hit) by referring customers to complementary shops or products! Learn more about how affiliate marketing works, why I think it makes sense for online shop owners, and how to get started here. Plus, I share three ways shop owners can naturally incorporate affiliate marketing into your brand. If you want to learn more about affiliate marketing from a pro, this is the training I took that helped me grow my average affiliate income from $50 – $600 a month. It’s easier to get a past customer to buy from you again, then it is to convert a brand new customer. So how can you deepen your relationship with your current customer base? Reach out to them with little thank you cards, Instagram polls, more frequent Instagram Stories, or more helpful/advice filled emails – instead of promoting your shop. Work to move past just a transactional relationship and really get to know them + connect over common interests/motivations that still fit within your brand. *Instagram Stories has been one of the TOP ways I’ve connected with my audience on a deeper level. I’ve been able to increase the reviews and testimonials I receive, get immediate feedback on new ideas, and actually talk and have great conversations with followers to build my ‘know, like, and trust’ factor. 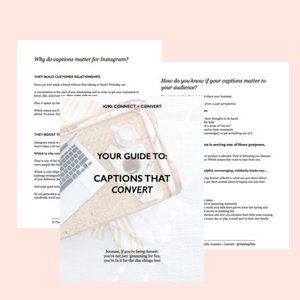 I highly recommend making your Stories part of your overall Instagram strategy, I found the tips and ideas laid out in GramSlam incredibly helpful for someone who’s not 100% comfortable yet with video! If you have an idea you’re thinking about for the holiday season, prepare a few and run a super limited edition or flash sale to gauge interest! It’s an easy way to inject excitement into your business, without discounting your entire shop or feeling pushy sending a bunch of emails (which you shouldn’t feel anyway, but sometimes when sales are slow we start to really doubt ourselves). Plus, this gives you proof of concept so you can feel comfortable making it a bigger deal during the holiday season. You’re not just asking if they’d be interested – someone has to actually put money down. **PRO tip: If you don’t do this yet, be sure to track your monthly income so you can anticipate and be prepared for your peaks and slow seasons. EVERY. I repeat, EVERY business has periods where sales are slow. So it’s more important that you track your sales trend based on prior year growth – rather than just expecting your income to increase each month. This can be especially hard when you’re new in business. With all the work you’re putting in, you expect to see your income grow month over month! But it’s also important to know that a “down trend” in monthly income may not really be a lack of growth – just a regular part of your yearly sales cycle. I’d love to hear from you — what is your experience with “the summer slowdown”? What are your best tips for what to do if summer sales are slow?